Combine crafting and gardening with this pizza garden kit. Plant basil, peppers, oregano, and tomato seeds. All seeds are non-GMO. Once these savory pizza essentials sprout, transport them outside or into a bigger pot. After weeks of tending to your growing plants, they will be ready to harvest and you can enjoy the fruits of your labor in the kitchen with a homemade pizza-recipe included. Bon Appetite! With this complete set you have everything you need to decorate, plant, water and grow! 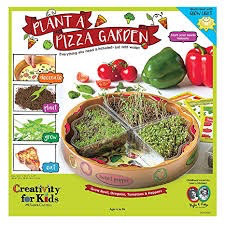 This Pizza Garden kit is the perfect STEAM experience for children of all ages. Learn how to nurture your garden from seed germination through harvest, then turn your tomatoes, peppers and herbs into a tasty pizza – recipe included! Garden tray measures 10 ½” diameter x 1 ¼” high. Start your plants indoor by using it with GROW Light (#6118) to maximize your results.